In 2017, three Girl Scouts in the Mountain Communities region attended Girl Scouts of Colorado summer camp after receiving camperships from the Mary Jo Jacobs, M.D. Memorial Girl Scout Adventure Fund. Kayla of New Castle went to Tomahawk TriWizard at Tomahawk Ranch in July. At Animal Adventures at Sky High Ranch, Sami from Glenwood Springs played a lot of games, got to know her Girl Scout sisters, and really enjoyed singing outside the mess-hall before meals! Even though they had to be up VERY early to get to the barn to help with the animals’ care, it was WAY worth it. Her favorite animal was Wilbur the pig, but the llamas spit! She loved caring for the chickens and goats, too. Sami came home with so many stories to tell – from the giant squid to the Queen of the Forest and she can’t wait to go back! Mya of Eagle attended “Penthalon” at Sky High Ranch in July. Registration for Girl Scout Camp is now underway on the Girl Scouts of Colorado website at girlscoutsofcolorado.org. For summer 2018, girls can attend overnight camp sessions at Sky High Ranch near Manitou Lake and Woodland Park or perennial favorite Tomahawk Ranch near Bailey, southwest of Denver. Activities include archery, backpacking, photography, and rock climbing. Overnight camp runs from 3 to 12 days for girls ages 6 and up. Girl Scouts of Colorado will continue to offer day camping adventures throughout the state. The summer camp schedule is live on the Girl Scouts of Colorado website (girlscoutsofcolorado.org). Girl Scout summer camp programs are open to all girls throughout Colorado, whether they’re in a troop or not, and new campers get a 10-percent discount. Katie Strickland, of Garfield County, also received the Mary Jo Jacobs, M.D. Memorial Girl Scout Adventure Fund. She attended “Zip Life” at Sky High Ranch outside of Colorado Springs. Registration for Girl Scout Camp is now underway on the Girl Scouts of Colorado website at girlscoutsofcolorado.org. For summer 2016, girls can attend overnight camp sessions at Sky High Ranch near Manitou Lake and Woodland Park or perennial favorite Tomahawk Ranch near Bailey, southwest of Denver. Activities include archery, backpacking, photography, and rock climbing. Overnight camp runs from 3 to 12 days for girls ages 6 and up. Girl Scouts of Colorado will continue to offer day camping adventures throughout the state. The summer camp schedule is live on the Girl Scouts of Colorado website (girlscoutsofcolorado.org). Girl Scout summer camp programs are open to all girls throughout Colorado, whether they’re in a troop or not, and new campers get a 10-percent discount. Two Colorado Girl Scouts are headed to Girl Scouts of Colorado summer camp after receiving the Mary Jo Jacobs, M.D. Memorial Girl Scout Adventure Fund. Katie Strickland, of Garfield County, will attend “Zip Life” at Sky High Ranch outside of Colorado Springs. Kyla Wolffe, of Eagle County, is going to “Pirate Splash Camp” at Tomahawk Ranch near Bailey. What is Kyla most looking forward to at camp? Celebrating her birthday the first night she is there, catching her own fish for dinner, and of course, making new friends! More than 30 Girl Scouts from Eagle, Chaffee and Summit counties spent the weekend of April 25-27 learning about the impact of Colorado’s winter weather on the landscape for the rest of the year in the state. The event took place at the Keystone Science School, who in partnership with Girl Scouts of Colorado, have been providing a series of STEM (science, technology, engineering and math)-related camps over the last four of years for area Girl Scouts. Saturday’s activities included several hours of hiking nearby Keystone to see first-hand the impacts of the snow pack. Groups hiked around Keystone, Lake Dillon as well as Montezuma, which is a 20-minute drive from Keystone, along the Continental Divide. Snow pack was gone in many areas, except for the group that hiked in Montezuma. “We hiked in waist deep snow,” said Girl Scout Maggie, 9, from Buena Vista. Maggie’s group found that through the course of their hike they were witnessing snow melt in process. “The snow was hard in the morning (making it easier to walk on), and softer in the afternoon (when we sunk in walking),” said Bailey, 13, also from Buena Vista. Out on the trail each of the groups enjoyed lunch and learned where all the snow/water in Keystone ends up. Back at camp after the hike, the Girl Scouts got to take a look at an experiment they had set up before they left. Each of the groups had placed snow from around camp in a cup or jug and had made personal predictions for how much water they thought would come from the snow. “I understood the water cycle before I came (to camp), but I didn’t know how it all happened. I’m learning a lot, and it is cool to try out (earth science),” said Chianne, 9, of Buena Vista. One of the concluding activities on Saturday afternoon was how water causes erosion. The girls worked in groups with tubs of sand to create a landscape. Some added rocks from around camp as well. Then they turned on the small water hose hooked up to each tub and witnessed how water could help or hurt the landscape they created. Lilli, a 6-year-old Girl Scout Daisy from Summit County, loved every moment of the camp because she can’t wait to be a scientist one day. “I like science and learning new things. I love experiments,” said Lilli. Grant funding provided by Freeport-McMoRan Copper & Gold Foundation Climax-Area (CO) Community Investment Fund and Copper Environmental Foundation helped make this weekend camp and other camps in the series possible. STEM is a core curriculum focus in Girl Scouting because more men enter STEM fields than women. Girl Scouts’ research shows that girls are interested in STEM but are not as knowledgeable about the careers and the opportunities afforded by these fields. By introducing girls to STEM in a hands-on setting and showing them how they can make the world a better place through STEM, Girl Scouts hopes to attract more girls to lead in these field. For more information on Girl Scouts of Colorado visit girlscoutsofcolorado.org. Girl Scouts of Colorado was recently awarded a $10,000 grant from the Freeport-McMoRan Copper & Gold Foundation to fund environmental education programs for Lake, Chaffee and Eagle Counties in collaboration with the Keystone Science Camp. Read more about this grant and view photos from the check presentation on April 26. In the last couple of weeks, I hope you’ve had a chance to learn more about how the Colorado Hispanic community is participating in Girl Scouts. If you’ve missed our other blogs, read them here (Blog #1, Blog #2). 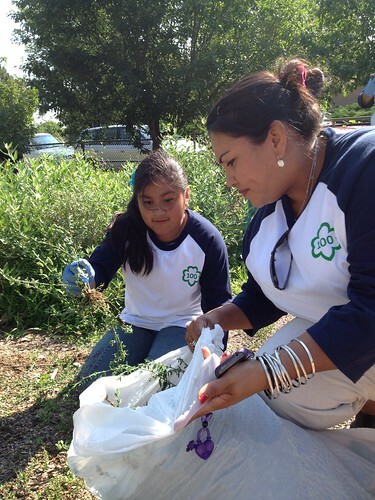 This summer Girl Scouts of Colorado received a grant from the MetLife Foundation, which has helped us bring, through the help of volunteers, the Girl Scout Journey program to Hispanic middle school students around the state. In the both Summit and Eagle counties we’ve recently started new bilingual Girl Scout troops led by local volunteers. In Northern Colorado we’ve participated in Ciñco de Mayo celebrations in Greeley and Longmont and partnered with local schools, City of Greeley Recreation Department and organizations, like the Boys and Girls Club, to offer volunteer-led Girl Scout programming, including our Power Up bullying prevention program. We have served more than 310 new girls! We recently started a neighborhood pilot program in Weld County where we are teaching adults involved in Adults Learning English as Second Language (ESL) classes about Girl Scouting and giving them opportunities to practice their skills by teaching a short-term Girl Scout program. We’ve also partnered with local radio stations, such as “El Tigre” KGRE/KRKY & KRYE Radio, to help us spread the word. In Pueblo we started a Hispanic troop that is part of the Grupo Folklorico Dancers. Pueblo area Hispanic leaders have also started a Girl Scout Advisory Committee. I also wanted to share with you a video we recently produced for the Hispanic community to invite them to be members or volunteers of Girl Scouts. The video is in Spanish, and I encourage you to share it if you have connections to Spanish-speaking communities. I’ve enjoying blogging with you during Hispanic Heritage Month, and hope you will explore how you can support Hispanic/Latina Girl Scouts by contacting us at 303-607-4813 (1-855-726-4726 , ext. 4813) or preguntas@gscolorado.org.